This article demonstrates how to use the CellContentTemplateSelector property. 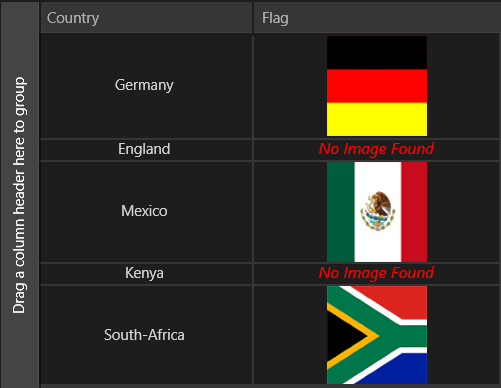 The following example shows pictures of flags. Some of the flags do not have pictures so we will take advantage of the CellContentTemplateSelector property to handle this case with an appropriate DataTemplate. Our logic is pretty simple. When there is an available picture, it will be displayed and when there is not an available picture, a proper message will be displayed. <TextBlock Text="No Image Found" FontSize="16" FontStyle="Italic"